'The three kimonos' is an important work in a series of Velázquez-inspired portrait groups produced by George W Lambert in his London studio. It depicts three women dressed in kimonos enveloped by sumptuous layers of fabrics, encapsulating the vogue for Japonisme and exotic orientalism. The figures are set in an almost metaphoric landscape against a cloudy sky. 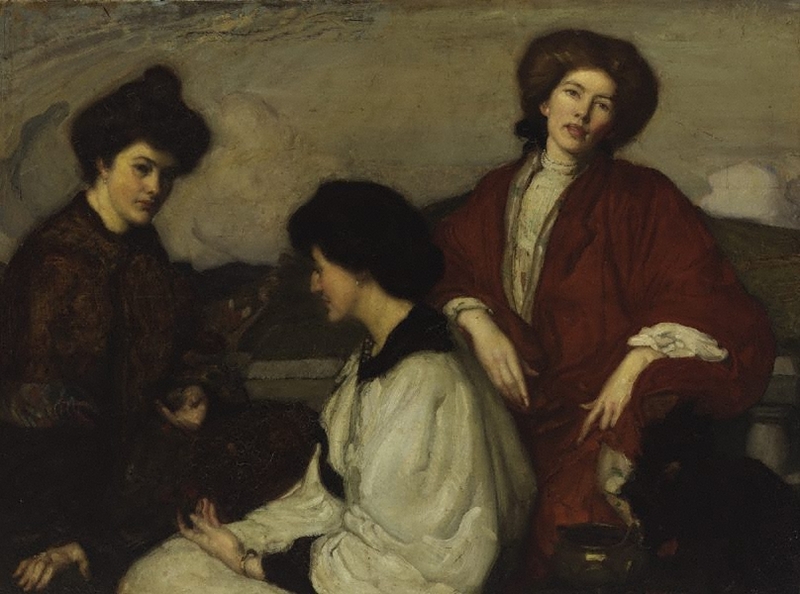 Highlighting the sensual nature of the painting, the middle woman has turned her head to reveal the nape of her neck, which forms the very centre of the composition. The painting evokes a sense of theatricality by making the figures appear as performers on a stage in front of an idealised backdrop. Lambert is one of Australia's most remarkable artists working during the turn of the century. From 1894 he exhibited with the Art Society and the Society of Artists, Sydney. In 1899 he won the Wynne prize with 'Across the Black Soil Plains', which was bought by the National Art Gallery of New South Wales. After being awarded the Society of Artists Travelling Scholarship in 1900, Lambert sailed to Europe spending time in London and studying in Paris at Colarossi's art school and at the Atelier Delécluze. 'The three kimonos' was the second of three works that Lambert painted for the Trustees of the Art Gallery of New South Wales to fulfill the conditions of his scholarship. Signed l.r., "G.W. Lambert - N.S.W.". Not dated. Art and Artifice: George Lambert (1873-1930) , 1996, 178 (illus.). Amy Lambert, Thirty years of an artist's life : the career of G.W. Lambert, A.R.A , Sydney, 1938, 37. A catalogue of Australian oil paintings in the National Art Gallery of New South Wales 1875-1952 , Sydney, 1953, 106. Australian painting 1788-1970 , South Melbourne, 1971, 156-157. Editor Unknown (Editor), Art and Australia (Vol. 28, No. 2) , Sydney, Winter 1990, 214. Unknown, The Lamberts. George, Constant & Kit , London, 1986, 41. The Sydney Morning Herald , Sydney, 25 Mar 1939, 21. Editor Unknown (Editor), Daily telegraph , Sydney, 07 Dec 1906.